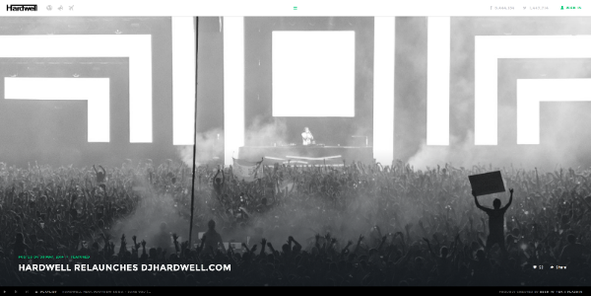 Revealed Recordings head honcho Hardwell recently announced the relaunch of his website. Now featuring an interactive biography including personal family photographs, the chronological timeline maps out Hardwell’s voyage from humble beginnings in his Dutch motherland, over to a big name DJ and producer that plays around the world. The site incorporates all of Hardwell’s social media channels and additional key features also include an integrated media player for ease of listening when browsing, along with a single-page discography overview. An interactive world map also provides a comprehensive summary of his approaching live dates, allowing visitors to track, stay informed and even purchase tickets for upcoming gigs. Joining forces with Beer 'n' Tea and Flashin, two internet companies hailing from Hardwell’s own hometown of Breda, this all new website manages to take his music and artist presence and turn into in to a digital experience. With upcoming residencies confirmed, including weekly sets at daytime venue Ushuaïa Ibiza, Hardwell has also invited visitors to submit media recorded at his live shows, with the chance to be included in the video for his Prodigy-sampling latest smash, ‘Everybody Is In The Place’. Check it out here: www.djhardwell.com.